CERRITOS — Businessman/attorney Frank Aurelio Yokoyama is one of seven candidates competing for two open seats on the Cerritos City Council in the March 5 election. Also in the running are incumbent Carol Chen, retired social worker Alejandro Estella, businessman George Ray, retired police officer Kiyong Ma, ABC Unified School District board member James Kang, and homemaker Gerad Valencia. 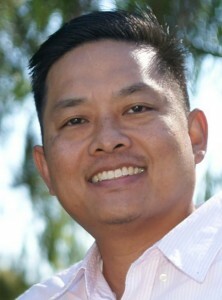 Yokoyama is a member of the Cerritos Planning Commission, real estate broker, attorney, local business owner, and youth sports coach for basketball and soccer. As a planning commissioner, he reviews and approves plans for new businesses and home improvements to strengthen the local economy and increase property values for Cerritos residents. He and his wife, Wendy Ha Yokoyama, have two children, Makenna and Maddox, who are attending Leal Elementary School. The Yokoyamas have been active PTA and school foundation board members and volunteers in ABC schools. Frank Yokoyama has resided in Cerritos since 1976. His parents, Tom and Chit, raised him and his three sisters there, and all four siblings graduated from ABC schools. Growing up, Yokoyama played SEYO sports with the Southeast Japanese School and Community Center, and now his kids play SEYO basketball. Yokoyama graduated from UC Berkeley Business School and Harvard Law School, and returned to Cerritos to raise a family. Tom Yokoyama was born in Sacramento and was interned with his family at Tule Lake and Topaz during World War II. After the family settled in the Los Angeles area, he served in the U.S. Army as a missile specialist and medic, earned a bachelor’s degree in nursing through the G.I. Bill, and worked as a registered nurse. He earned a real estate broker’s license in 1979 and opened Wise Ol’ Owl Realtors in Cerritos. If elected, Yokoyama said, his goals are to prioritize the safety of the community; protect the quality of life for all residents; partner with school leaders to better serve students; bring new ideas to strengthen the local economy; and fix streets, sidewalks, walls, trees and parks. His endorsers include Rep. Alan Lowenthal; former State Sen. Betty Karnette; former Assemblymembers Tony Mendoza and Sally Havice; former Cerritos Mayors Laura Lee and Dr. Daniel K. Wong; Cerritos City Councilmember Mark Pulido; ABC Unified School District Board President Celia Spitzer and former presidents Olympia Chen and Cecy Groom; Cerritos College Board Secretary Dr. Sandra Salazar, board member John Paul Drayer and former board member Dr. Tina Cho; Cypress School District Board President Brian Nakamura; Hacienda-La Puente USD Board President Jay Chen; Hawaiian Gardens Mayor Victor Farfan, Mayor Pro Tem Mike Gomez and City Councilmember Michio Oyama-Canada. For more information, visit www.frankyokoyama.com or the candidate’s Facebook page.